BRANDON, S.D. 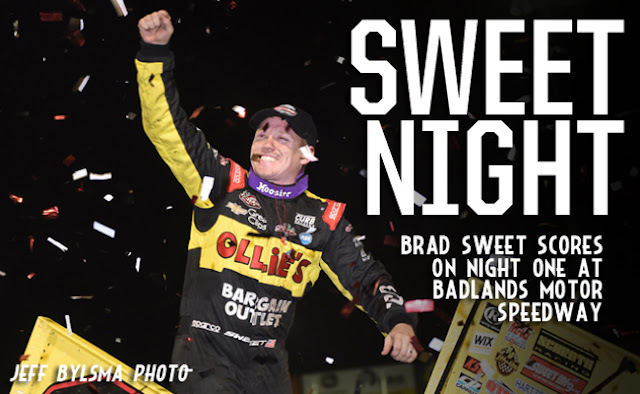 - July 2, 2016 - Brad Sweet led early and led often at Badlands Motor Speedway on Saturday night as he found luck and persevered to score his seventh World of Outlaws Craftsman® Sprint Car Series victory of the season. Sweet's win is his first since May 13 at Plymouth Speedway. "It feels good. This team needed that win - we've been in a bit of a slump," Sweet said. "We just haven't been able to compete for wins over the last 10 or 15 races. We started out the season really strong and then kind of fell off there. So it's nice to get back to victory lane and give these guys some confidence." Abreu's lead was short-lived though as he dove low off of turn four he caught a tire barrier which sent him flipping. Abreu was OK but his night was over. "The Ollie's Bargain Outlet car was phenomenal all night long," Sweet said. "In the A main we could really get moving around the top. We could move around too. I was just waiting to see if someone was going to show me a nose. "40 laps around here is a long race. It's a California kind of race. It's short and you've got to attack the corners. I'm really proud of my guys." With his win, Sweet chipped away at Donny Schatz' championship points lead, bringing the lead to 72. Saldana, who had an issue late, ran near the front most the night in his No. 83 Roth Motorsports car and closed out the night in second. "Definitely very lucky tonight. About five or six to go my belts came undone," Saldana said. "So I'm just trying to finish the race and then Jason crashes in front of me. So that's not what you want to see - hopefully he's OK. Luckily we finished the night on the front straightaway. We'll take it and come back tomorrow." Gravel, who closed out the night in third had his sights set on Sunday at Badlands and improving on the team's podium finish. "We didn't get in the Dash like we wanted to so to finish on the podium is great," Gravel said. We had a really good car there in the middle of the race. We faded a little bit late but Brad and Joey had really good cars. We probably had a third or fourth place car but with Jason blowing a tire that put us third. We're really happy with third." Donny Schatz was the night's KSE Racing Hard Charger, advancing 12 positions to finish in seventh. he World of Outlaws Craftsman Sprint Car Series wraps up its double header at Badlands Motor Speedway tomorrow, Sunday, July 3. For more information and to learn how to purchase tickets, visit WoOSprint.com/Badlands-Motor-Speedway. RACE NOTES: Matt Juhl picked up his first ever World of Outlaws victory tonight after a qualifying quick time of 10.820… Ian Madsen was the night's highest finishing non-Outlaw driver. He finished the night in eighth… Brad Sweet chipped away at Donny Schatz's points lead, bringing the separation to just 72 points… Tonight's win was the seventh of the season for Sweet and his first ever at Badlands Motor Speedway… Tonight's feature was the 40th World of Outlaws feature completed at the track. CONTINGENCY WINNERS - MSD Ignitions ($25 cash): Logan Schuchart; MSD Ignitions ($50 cash): Brad Sweet; Penske Shocks ($50 cash): Paul McMahan; JE Pistons ($50 cash): Paul McMahan; VP Racing Fuels ($50 cash): Jacob Allen; Edelbrock ($50 cash): Jacob Allen; Comp Cams ($50 cash): Paul Nienhiser; Morton Buildings ($50 cash): Paul Nienhiser; Cometic Gasket ($50 cash): Daryn Pittman; Super Flow ($50 cash): Terry McCarl; Craftsman/Sears ($100 cash): Rico Abreu; KSE Racing Products ($100 product certificate): Donny Schatz; Comp Cams ($50 product certificate): Brad Sweet; JE Pistons (Set of Rings): Austin McCarl; JE Pistons (Set of Rings): Logan Schuchart. SEASON WINNERS: Donny Schatz - 11 (Volusia Speedway Park on Feb. 14, The Dirt Track at Las Vegas on March 4, Stockton Dirt Track on March 18, Stockton Dirt Track on March 19, Silver Dollar Speedway on April 2, Lincoln Speedway on May 19, Weedsport Speedway on May 22, Lincoln Park Speedway on June 8, Knoxville Raceway on June 11, River Cities Speedway on June 17, Rockford Speedway on June 29); Brad Sweet - 7 (Volusia Speedway Park on Feb. 13, Volusia Speedway Park on Feb. 14, Cotton Bowl Speedway on Feb. 26, Ocean Speedway on April 1, Bakersfield Speedway on April 15, Plymouth Speedway on May 13, Badlands Motor Speedway on July 2); Daryn Pittman - 5 (Royal Purple Raceway on Feb. 27, Perris Auto Speedway on April 16, USA Raceway on April 18, New Egypt Speedway on May 24, Jackson Motorplex on June 24); Shane Stewart - 5 (Arizona Speedway on March 6, Devil's Bowl Speedway on April 23, Lawrenceburg Speedway on May 30, Granite City Speedway on June 15, Brown County Speedway on June 19); Joey Saldana - 4 (The Dirt Track at Las Vegas on March 3, Devil's Bowl Speedway on April 22, Jacksonville Speedway on May 4, I-80 Speedway on June 22); David Gravel - 3 (Thunderbowl Raceway on March 12, Tri-State Speedway on May 14, I-96 Speedway on June 6); Kerry Madsen - 2 (Eldora Speedway on May 6 and 7);Bill Balog - 1 (Beaver Dam Raceway on June 25); Lance Dewease - 1 (Williams Grove Speedway on May 20);Chad Kemenah - 1 (Fremont Speedway on June 3); Jason Johnson - 1 (Placerville Speedway on March 24);Terry McCarl - 1 (Knoxville Raceway on June 10); Jason Sides - 1 (I-30 Speedway on April 26); Greg Wilson - 1 (The Dirt Track at Charlotte on May 27). World of Outlaws Craftsman® Sprint Car Series Statistical Report; Badlands Motor Speedway; Brandon, S.D. ; July 2, 2016.